Thursday is here and the weekend is near! ABCey Events has our Weekend Lineup with the top 5 Bay Area and SF events that you don’t want to miss! Jump into the J-Pop world at this summit and discover Japanese tech, culture, music, food, and film! This huge event starts Friday with Kyary Pamyu Pamyu performing as part of their World Tour (tickets and info). Then prepare yourself for a jam packed summit Saturday and Sunday. You won’t run out of things do with with: meet and greets with J-Pop stars, live performances, tech tradeshow/sessions, fashion events, interactive Summit/Showcase, panel discussions, and workshops! If that isn’t enough for you, get excited for the amazing food trucks and vendors. Guys-they have a “Sake Summit”! Also throughout the weekend, head to the Japan Film Festival for exclusive live-action and animation films, appearances, and Q&A’s. So dress up if you’re feeling adventurous, and check out this top SF event! 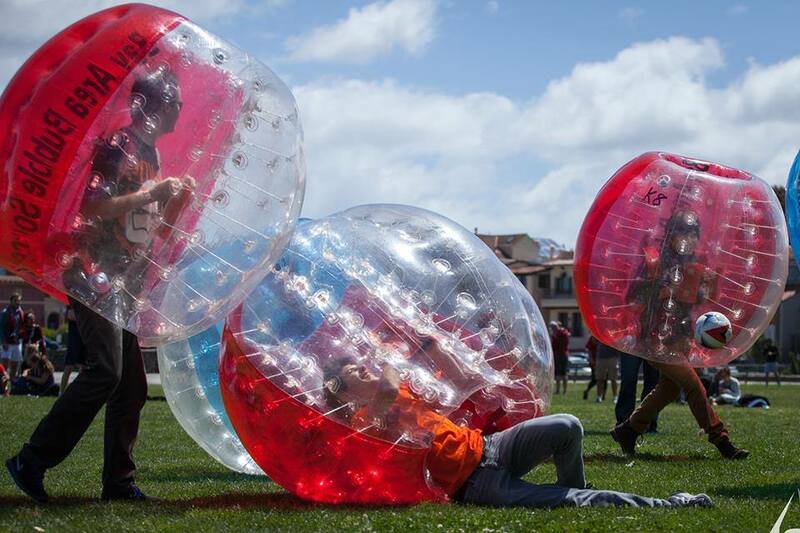 With this beautiful weather, why not get out there and enjoy the great outdoors-with bubble soccer! With an inflatable ball around your head and torso, you never have to worry about getting hurt! The San Francisco Deltas, an American Professional soccer team, invites everyone to come learn about their team, and if you arrive before 2:30pm you get a SF Deltas scarf free! Start your weekend off right this Friday and have lots of fun bouncing and rolling around! Let the Mad Hatter be your host while you dine on an amazing feast and hangout with the cast of Alice and Wonderland! Get sucked into the magical wonderland, drink special elixirs and watch the characters and cirque, belly, and burlesque dancers perform for you. If the Cheshire Cat hasn’t hypnotized you enough, stay for dessert (extra purchase of tickets and dessert required). Now don’t be late for this very important date, jump down the rabbit hole this Saturday, and enjoy a unique experience you won’t forget! Want to be a pirate? Well now you can! Grab your family or a few pals, and go searching for a buried treasure throughout McLauren Park this Saturday. Not only will you find a treasure, but you can also get prizes, eat great food, get your face painted, do Zumba, and play on the mobile recreation (rock climbing, biking, skateboarding, and slack lining)! So come out, and find the buried treasure! Come and explore the San Francisco Museum of Modern Art with your family! To showcase their sonic installation, a collaboration with Chris Kallymer, the museum is hosting a free day where you’ll hear from his Paradise Choir (12, 1, 2, and 3pm) and Site-Specific Performances of his work (11am-3pm). Hear their stunning sound throughout the museum and join in on their mobile choruses, performances, and workshops. With so much to do, what’s stopping you from this free museum trip? Will you be attending any of these Bay Area/SF events? Any other SF events this weekend you’re excited about? Let us know in the comments below or on Facebook or on Twitter! We are super excited to be producing an event this coming Sunday, September 22nd, for Khazanah Nasional! They will be opening up a new office in beautiful downtown San Francisco. The event is Malaysian themed and they will be welcoming their Prime Minister, Datuk Seri Najib Tun Razak! Khazanah Nasional Berhad is the Government of Malaysia’s strategic investment fund. They promote economic growth and make strategic investments on behalf of the Government. They have invested in over 50 major companies around the world which range over a broad spectrum of work. ABCey was hired to manage all aspects of event planning and production including, AV, lighting, catering, decor, florals, entertainment, videography and photography, and we couldn’t be more thrilled!